This week is pretty exciting, as tomorrow live on stream, I get to show you the new Lynx… that is if I can find one! Today see’s the end of the Seasonal Competitions and the last animal added to the Weightsaver Lottery, which is the Banteng! I have been watching the leaderboard for the weightsaver competition, it has been chopping and changing so much, and only 40kgs separate the top 10. The Weightsaver Lottery ends 9am CEST on Saturday, so good luck to all and I hope you find some heavy animals! Next week we will try have a little recap and try and look at some statistics from the competitions. Is there a question about the event you would like us to try answer? If you do, leave it in the Status Update discussion thread on our forums. I myself want to know how many people got all three mission packs completed! So instead of letting you wait to find out what comes with the Lynx and to ease everyone’s minds, this time I thought we would talk a little about what you can expect. 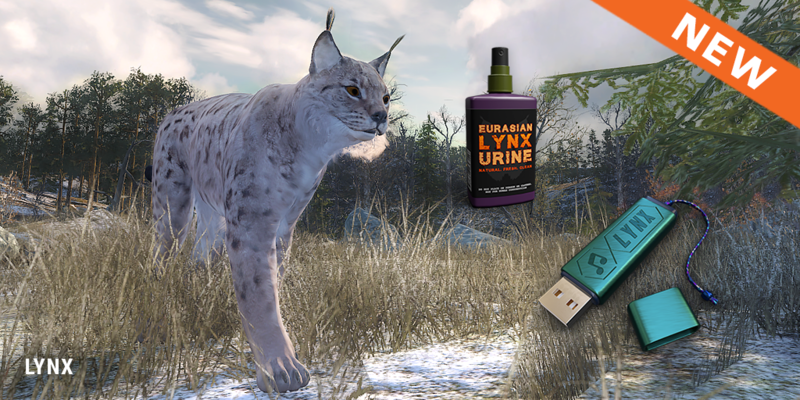 As you can see from the picture, there is some Urine Spray you can use to attract the Lynx, this will work like all the other Urine Sprays. I am sure the USB stick grabbed your attention more though. Once you have purchased this caller upgrade t automatically adds the new call to your E-Caller,, which you can select after placing your E-Caller. Please note, you need need to have purchased the E-Caller previously to be able to add the call. How does the Lynx differ from the Bobcat? Well apart from new animations and it being slightly larger, it also has a new animal interaction, but we are keen to let you guys see these interactions for yourselves… Hopefully we do not see it on tomorrow’s stream! Another key thing about the Lynx, this animal will be very rare, with low spawn numbers and on top of that it is very shy. We have done this on purpose to have a realistic representation in the game and once you bag one of these animals you can feel super proud of yourself. This should also accentuate that real life feeling of bagging an animal and all the hard work paying off! Currently on our Facebook and Instagram you can ask the Developers some questions. 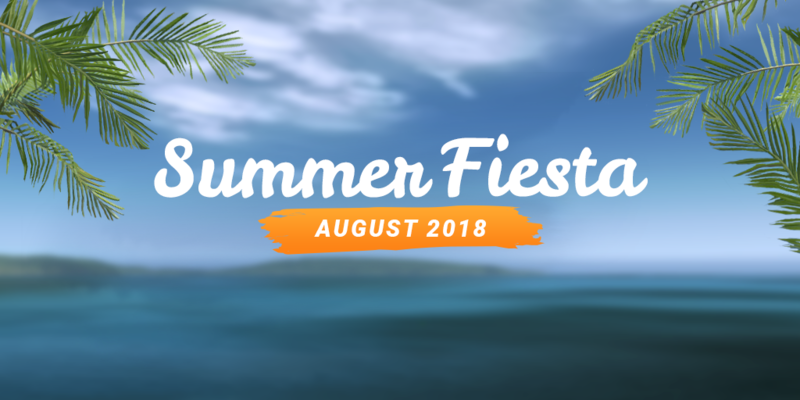 Once a week, one question will be selected and answered by a member of our team, all you have to do is find the post that has the above image and then leave your questions in the comments. 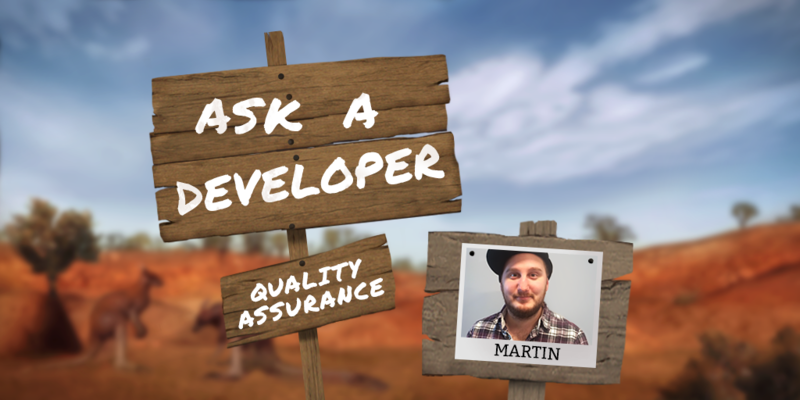 This question will be answered by our QA, Martin, here is his reply! Make sure to head over and let us know what you would like to know. A friendly bit of advice is to make sure they are questions, “I want to see X’ Is not a question and makes it hard for anyone to answer. Projectiles not registering after 500m. A fix for this is currently being tested and we will release it to you as soon as it passes. We have to run checks for every single weapon in game, so it is taking a little longer than expected. What’s bugging you the most? We are still working on the list and working out which ones are achievable to fix. Once we have a more solid list, we will let you know what you can expect in the near future. These Weekly competitions are super popular. The Trophy of the Week gets selected on Monday’s and Rare of the Week gets selected on Wednesday’s. 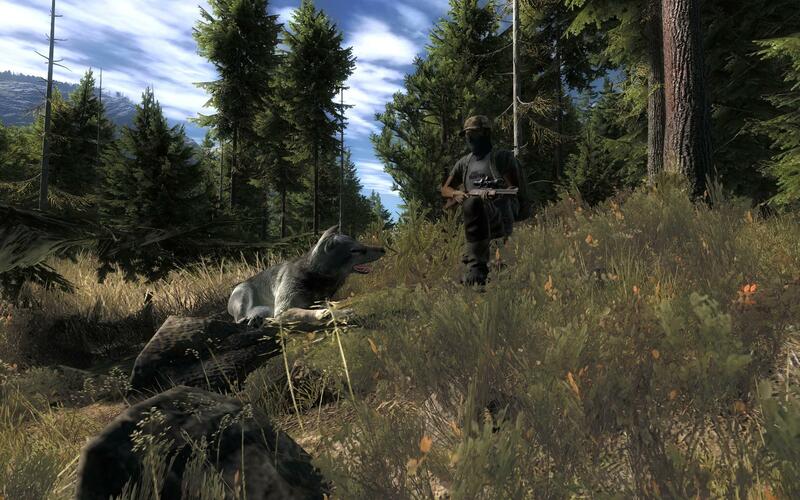 The ‘Trophy of the Week’ is this Grey Wolf, which was shot by ‘Siih’ and scored 16.812! If you are unsure of what many consider a trophy Grey Wolf, it is anything over the 16 scoring mark. 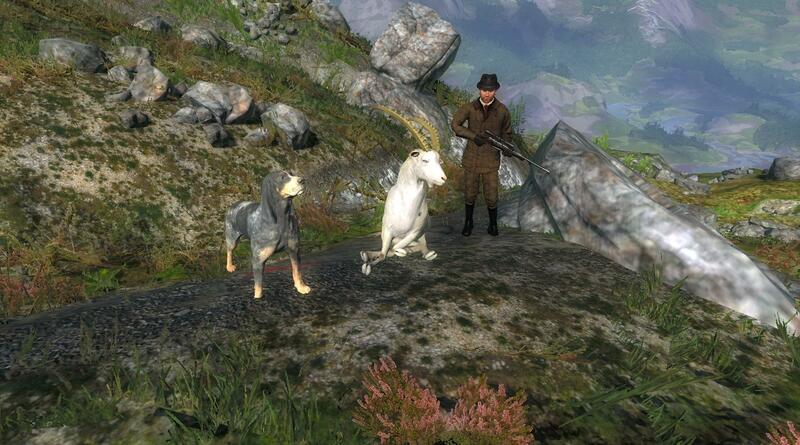 And the ‘Rare of the Week’ goes to ‘gulebule_SVK’ for this Albino Alpine Ibex with a score of 177.373 congrats! This is one of the more rarer rares around, a very nice find! This week’s free rotation lets our guest hunters test their skills against Sitka and Banteng. Good luck and have fun!